The holiday train has officially started at our house. It was a slow moving train at first, and I thought I was ahead of it, but all of a sudden it picked up speed and now I'm running behind it like a mad woman trying to catch up. I feel like I'm getting sucked into the holiday vortex. I am in complete denial that it is already December. All this is to say, that I may be MIA, but its for good reason. I love the family togetherness, the festivities, the parties, the party dresses, the food, the desserts (mostly the desserts) and the absolute chaos that ensues between mid November and early January. It's totally my kind of chaos. For a type-A scheduler like myself, I find the holidays to be the most fun game of schedule-tetris I play all year. How can we be in two places at the same time? No problem. I'll schedule us to be in each place for 30 minutes (not to mention the 45 minute travel time in between events and the in-car-costume change) just so we can do everything and see everyone. We are fortunate that our families are both local, so we are able to see both sides on every holiday. We do log a lot of miles this time of year, going back and forth between out house and our family's houses, but we wouldn't have it any other way. This will be our 12th holiday season together and we have it down to a science. We are finding we have to alter our plans a bit to accommodate the baby and puppy's schedules, but our family is incredibly understanding and we are able to shift things to make it all work. 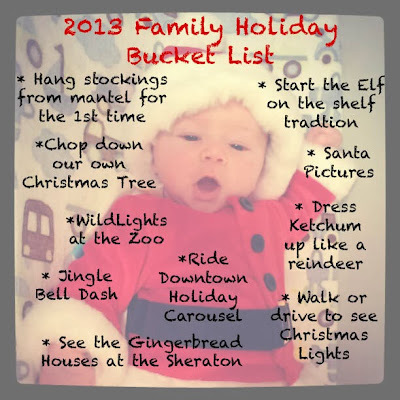 So, in between, the work functions, the family parties, the too-short-weekends and our annual New Year's eve ski trip, we want to ensure we still the chaos and carve out time to do fun things as a family. We want to start new family traditions; things we can continue for years to come. I created a family bucket list- a holiday to-do list of sorts. With any luck, we will accomplish all of these things (and maybe more). Now, I need to find the perfect Christmas outfit for Hunter....I'm thinking it may involve a bow tie.